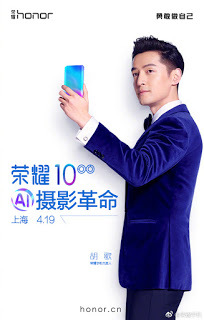 Huawei already set an an event on Apr 19th to unviel Honor 10 smartphone as successor of Honor 9.At this mwan time the devuce has appeared in TENAA with model no COL-AL10,COL-TL10,COL-AL00 and COL-TL00.The models are holding same features except RAM and storage. As per TENAA,Honor 10 will feature 5.84 inch FHD plus display with 2280×1080 pixel resolution.It will be equipped with 16MP+24MP dual camea setup with flash on rear and single 24MP shooter on front with AI capabilties.The handset measures 149.6mm length,71.2mm width and 7.7 mm thickness and weighs 149gm with 3320 mah lithium battery. Talking about power it is packed with 2.36 GHz Kirin 970 octacore processor which AI integrated.It has 4GB RAM and 64 GB native storage for COL-ALOO,4GB and 6GB RAM variant with 128 GB ROM for COL-TL00 and COL-AL00 has 4GB and 6GB RAM with 64 GB and 128 GB storage variants.And COL-TL10 has only 6GB RAM and 128 GB RAM variant.All of the models will run on EMUI 8 based on Android 8 Oreo.